I adore mayonnaise. I’ve even eaten it by itself before (don’t judge me, lol). My husband is not quite as enamored with it. It is a constant battle in our house with me surreptitiously trying to sneak more mayonnaise into things when he’s not looking. We go back and forth like that scene in Goodfellas when Pauly is warning Vinnie about putting too many onions in the sauce. Except for when it comes to this recipe. This one we agree on. The mayonnaise here is a fairly small amount and when combined with the lemon juice, the resulting texture is like a light, creamy dressing. It really lets the other ingredients shine. 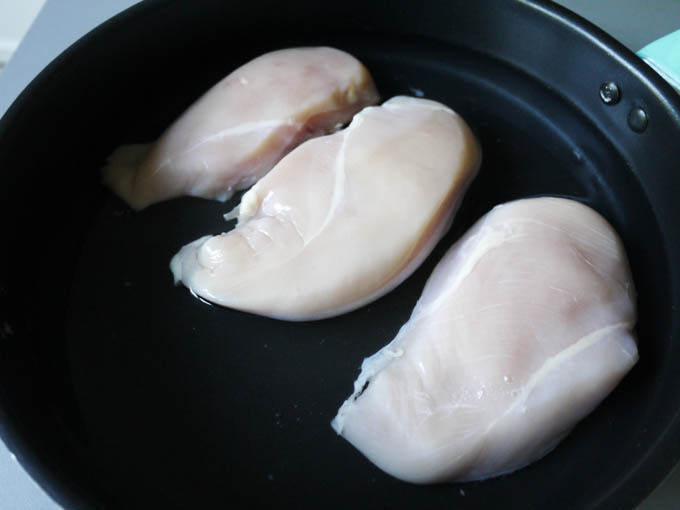 Place chicken in a skillet and cover with water. I like to toss a bouillon cube into the water for extra flavor, but this is optional. 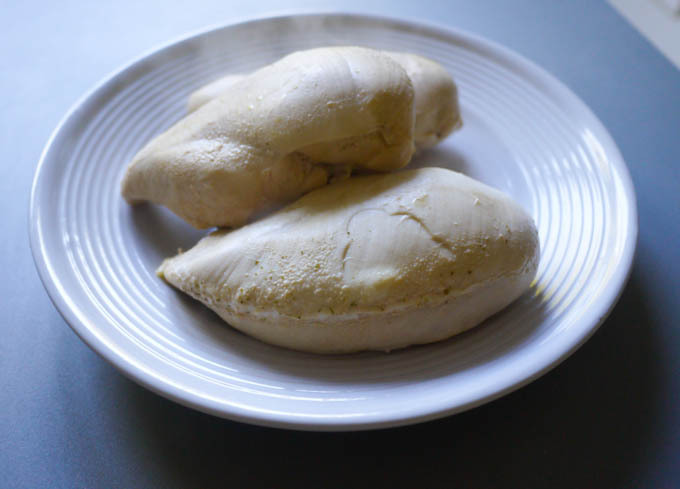 Boil chicken on high heat until cooked through, approximately 20 minutes. Let the chicken rest for at least 20 minutes on a plate. Do not skip this step. 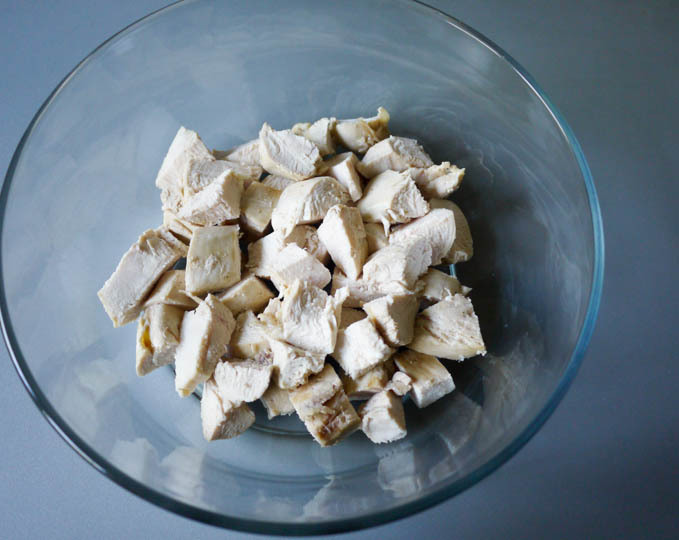 This is what will make the chicken really moist in the salad and since we are keeping the chicken cubes fairly large, it’s important that they are really flavorful on their own. Cut chicken into large 1-inch cubes and place in a large bowl. I like to serve this with parmesan crisps, which are crackers made entirely of parmesan cheese. 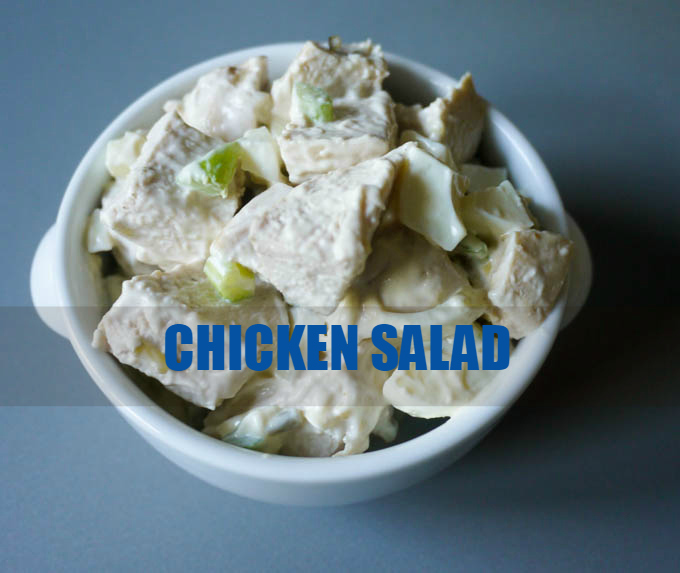 Healthy chicken salad with big chunks of juicy chicken breasts, egg whites, crunchy celery, relish and a light mayonnaise dressing. Let the chicken rest for at least 20 minutes on a plate. Do not skip this step. 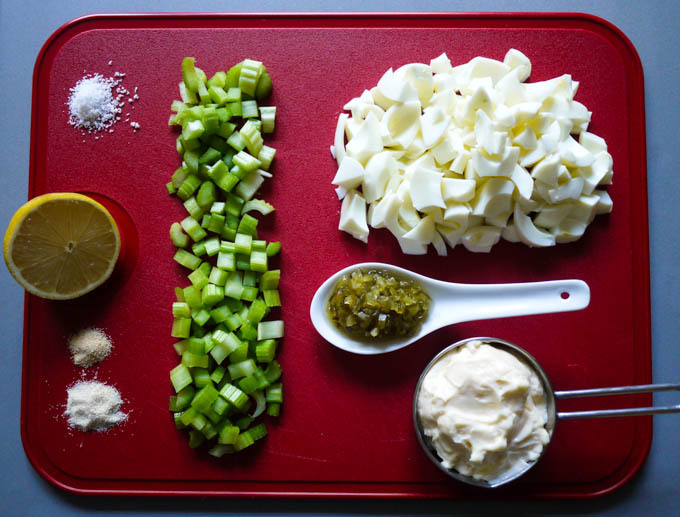 While the chicken is resting, get together the remaining ingredients. 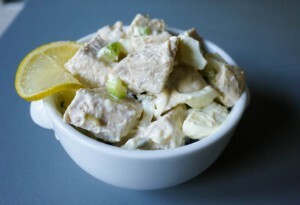 Cut chicken into large 1-inch cubes. Toss with the remaining ingredients and chill overnight. Didn’t bring breakfast to work today, and now I’m starving :'( My life just took a tragic turn. Ha ha ha! I am going on like 2 hours of sleep, so I’m basically on a coffee IV drip. I think if I stop drinking coffee for even a moment this morning, I will immediately fall asleep at my desk. Rock cocaine, bahahaha! 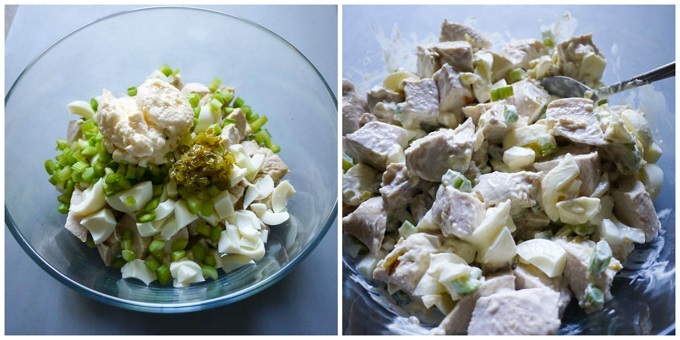 Would you believe I’ve never made chicken salad? I used to order one that had red grapes in it for sweetness. I appreciate the tip about letting the chicken rest for 20 minutes. And Parmesan crisps have been on my to-do list for months. Yum! LOL! 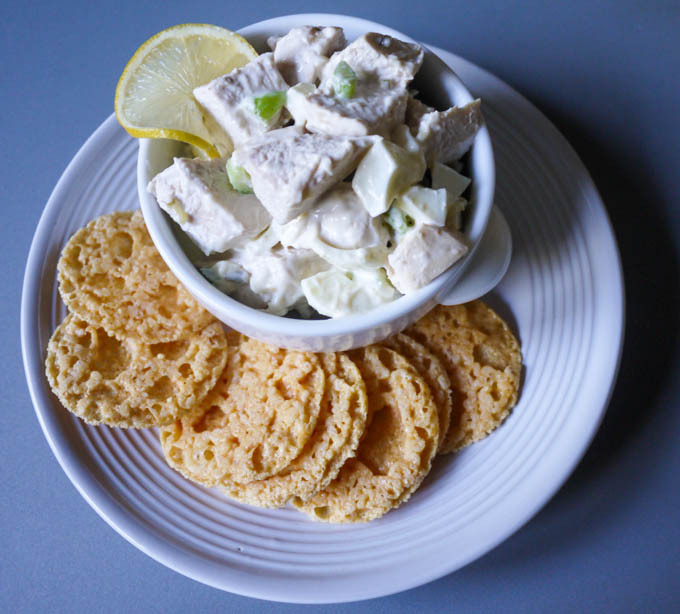 You absolutely have to try making your own chicken salad, but if you ever buy it again, make sure to try the Wine Country Chicken Salad from Trader Joe’s. It is absolutely amazing!